Building a basic dog house for an extra large dog can be quite easy if you follow a few simple steps. Of course, if you have a dog you love to pamper, you can enhance the dog house with extra features, including windows, carpeting, a green roof and even heating. Regardless of how pampered your pooch will be in the end, you should begin with the basic dog house structure, making sure your dog fits inside comfortably, and then adapt the underlying structure if you choose. 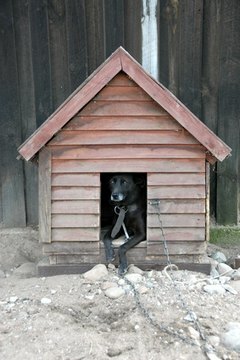 Size the house to fit your dog appropriately. If you have an extra large dog, you will want to build an extra large house, but ideally your dog should only be able to stand and turn around comfortably. Larger houses can be drafty in winter because the dog's body heat won't fully warm the house. No matter how large you make the house, the door should be only as large as your dog to ensure wind and rain will not get in. Allow for a vent in the roof to prevent overheating. Large dogs exert more energy than small dogs and can overheat quickly if placed in a hot dog house after a strenuous bout of exercise. Depending on your climate, you can add small vents in the roof or actual flapped ventilation systems. Raise the house off the ground. By raising the dog house a few inches off the ground, damp soil won't rot the dog house. Depending of the final placement of the house, you may want to build it on "stilts" or create a platform. Choose wood that has not been chemically treated. Any chemicals on the wood may affect your dog if he chews on it or lays on it for an extended period of time. Untreated or pressure-treated woods also age well, even in rain. Plywood works well if you are budget-strapped and comes in large sheets perfect for building a house for an extra large dog. Build your dog house using 2-by-6 boards for the frame and plywood for walls and the roof. Because you are building a large dog house, be sure to add extra roof supports in the center. Cover the roof with insulation and then roofing shingles. Builder's paper or asphalt shingles make quick and inexpensive roofing material. Have your dog stand in front of the dog house and mark a spot couple inches above his shoulders on one wall of the house. This should be the height of your dog house's door. The width should be about 4 inches wider than your dog. If your dog isn't full grown, you can make the door slightly larger than necessary so your dog will grow into it. Add custom details to enhance your design such as an extended roof, porche, insulation or other details. While some elements can be added after the house is built, you may want to plan for future additions so you don't have to take apart your dog house. You can also stain or paint the outside of the house for a finished look. If you aren't comfortable using a saw, or don't own one, most home improvement stores will cut your wood to the correct size when you purchase it. Just be sure to bring your plans for the dog house.